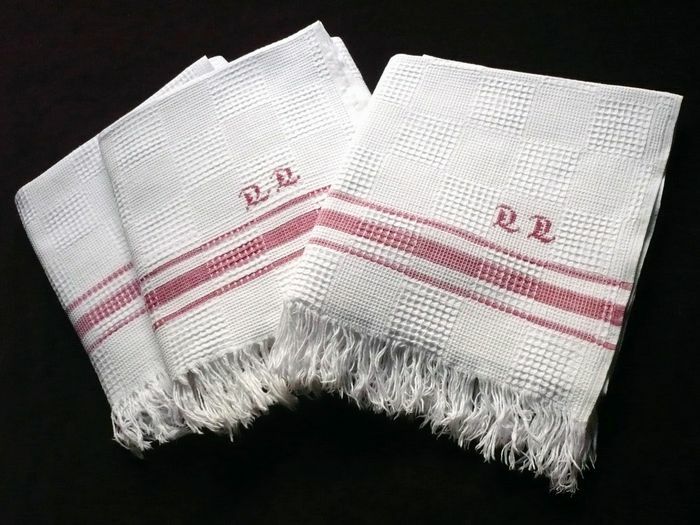 Three bright white cotton pique hand towels monogrammed "DD." These lovely towels have an interesting checkerboard waffle motif in their weave and are finished at either extremity with three red bands and a silky fringe. A discreet but beautiful monogram, embroidered with Germanic letters in a very fine red cross stitch, marks one end of each towel. Probably dating from the turn of the 20th century, these hand towels are in impeccable condition. (Three other identical sets of three available.) Dimensions: 38.5 x 18in.